Mayor of London Boris Johnson has condemned signs put up by Lambeth along the Southbank of the Thames which appear to ban cycling. The signs were put up following calls by local businesses and others to ban cycling because, they claimed, there was a major anti-social cycling problem along the stretch of the path between Albert Embankment and the Gabriels Wharf. The permanent looking signs have been erected for a ‘trial’ period of six months and currently are only advisory - the Police can't require cyclists to dismount unless they're riding wantonly or recklessly. To make these signs and any ban permanent the Council must apply for a traffic regulation order which must go out to consultation before being passed. Like Boris Lambeth Cyclists would prefer that cycling was not banned on this stretch of the Thames path as we feel that it is an important London leisure and commuter cycling route. We feel any ban will have a major impact on tourism as well as local cyclists’ use of the route and the ban would most likely be ignored by antisocial cyclists anyway. We would prefer to have a shared use pedestrian priority/ considerate cycling permitted type sign which would allow Police enforcement against anti-social cyclists but allow the majority of cyclists to use the route. At the same time we would also like the A roads that are the alternative route to be made more friendly for cyclists of all ages and abilities. In their current state we do not consider the Westminster and Lambeth roundabouts and Lambeth Palace Road to be attractive places for children and families in particular wishing to cycle. You can help in our campaign to ensure that the ban does not become permanent by contacting your councillors and MP – email them copying in Lambeth Transport department (cycling@lambeth.gov.uk) with your views on cycling on the Southbank reflecting on its wider importance for cycling in Lambeth and London. We hope to show that there are many ‘reasonable’ cyclists who use this route so that Councillors will think twice before bowing to pressures for a Traffic Order to implement a ban. You may want to also cite the opposition of Living Streets and possibly London Mayor Boris Johnson to the ban. You can find your councillors on the Lambeth website – www.lambeth.gov.uk. 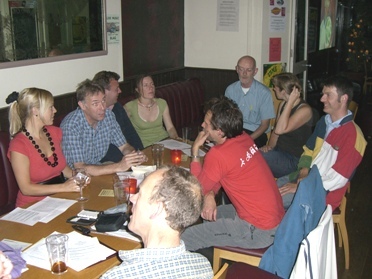 Lambeth Cyclists, the Lambeth borough branch of the London Cycling Campaign, meets regularly throughout the year on the third Tuesday of the month. The meetings take place in the upstairs room at the Priory Arms pub, 83 Lansdowne Way, London SW8 2PB at 7:30pm.